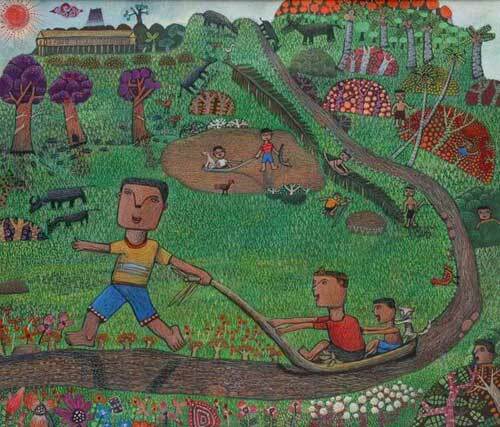 ‘This series of paintings is about the ilmu or knowledge that I learnt from my community and family and our Rungus worldview. My world changed when I started going to school and I learnt another kind of ilmu.’ And as noted in the context of Jainal’s words, ‘While the world changes for children leaving their villages to attend formal schools in the cities in order to learn a new set of knowledge for survival in the modern world, it is important that the old traditions and wisdom are also not forgotten’. 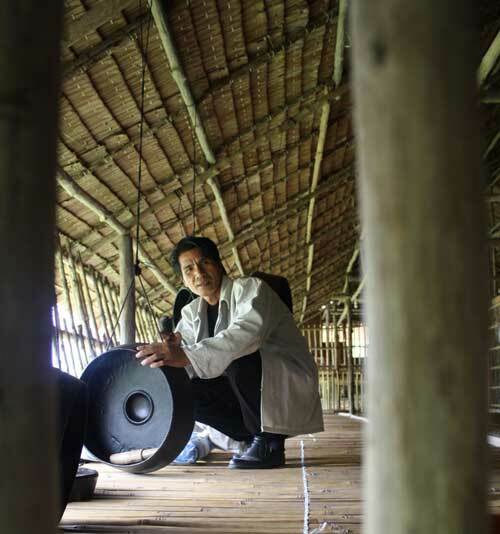 Jainal lives in Kudat, Sabah with his wife and their four children. Welcome to Mirrors Windows Doors, Jainal. 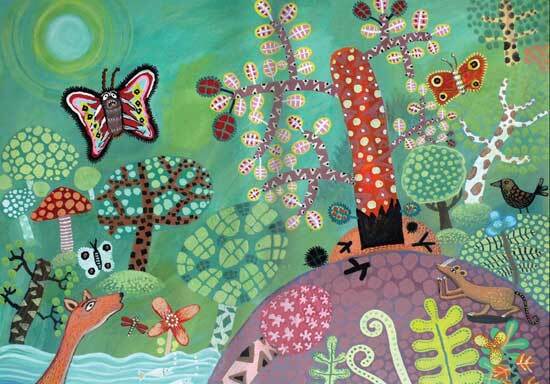 Who or what have been major influences on your artistic style? 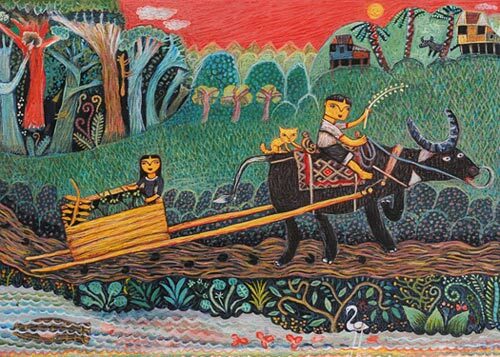 Yusof Gajah is my mentor, and he encouraged me to paint in the naive style. 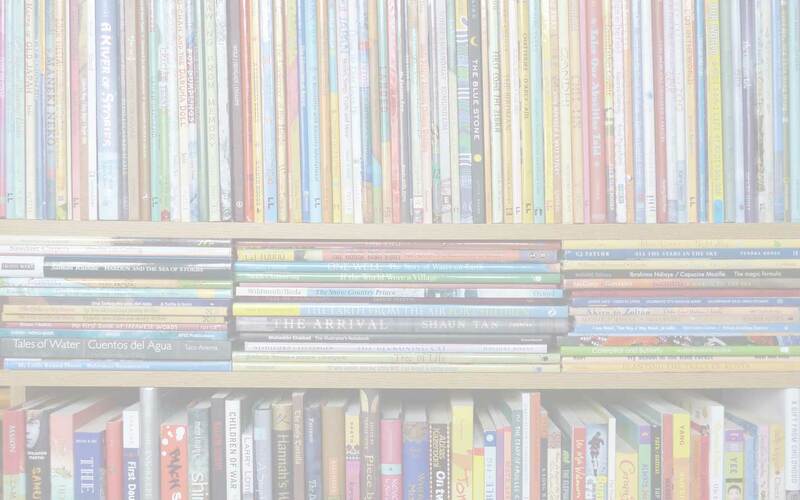 What was your path to creating children’s books? I attended a picture-book illustration workshop organised by Dewan Bahasa dan Pustaka [a government-linked publisher] where Yusof Gajah was the instructor. I learned a lot from there and had several picture books published by Dewan Bahasa dan Pustaka as an outcome of the workshop. I don’t have a fancy studio but I live on a farm and close to nature. I can see the paddy field, the coconut trees and Mount Kinabalu. 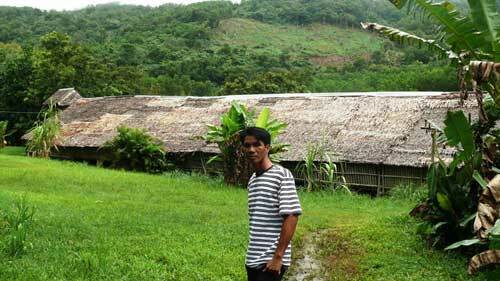 It is the tallest mountain in Malaysia. 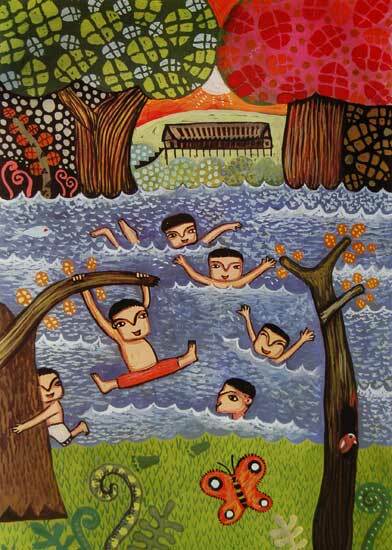 I like to paint Mount Kinabalu in my illustrations. Everywhere we go, we can see Mount Kinabalu watching us. 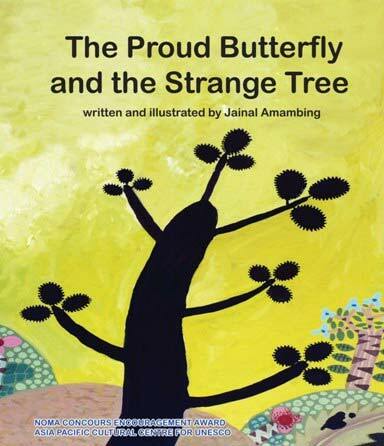 Jainal’s first picture book to be published was The Proud Butterfly and the Strange Tree ((Oyez!Books (Malaysia), 2010. 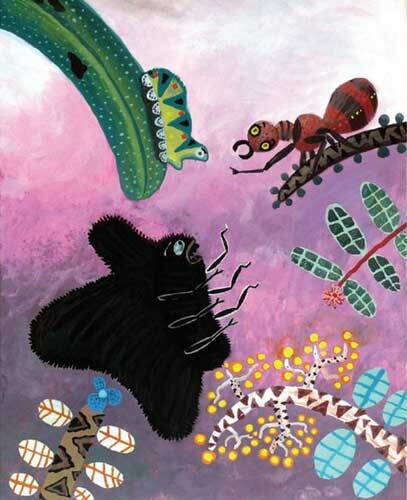 It tells the tale of the most beautiful butterfly in a lovely garden, who is shunned by the other butterflies because it is proud and boastful. One day it comes across a black, ugly tree and is so incensed that it sets about destroying it. 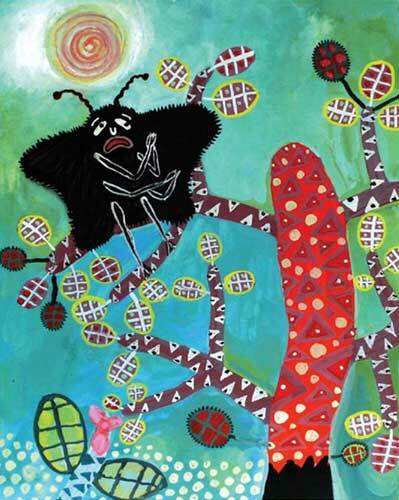 The next day the butterfly is horrified to discover that the tree has grown again and is colourful and beautiful – whereas the butterfly has lost all its colours and turned black. 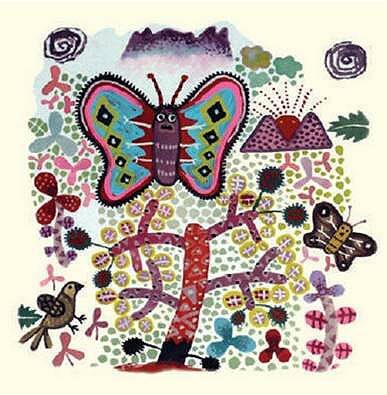 None of the other creatures in the garden want anything to do with it, but eventually the butterfly’s genuine repentance is rewarded and it regains its colours, its friends, but not its pride… It’s a simple but effective fable that is certainly brought to life by Jainal’s vivid portrayal of the butterfly’s emotions, as well as his distinctive strong colours and patterns. 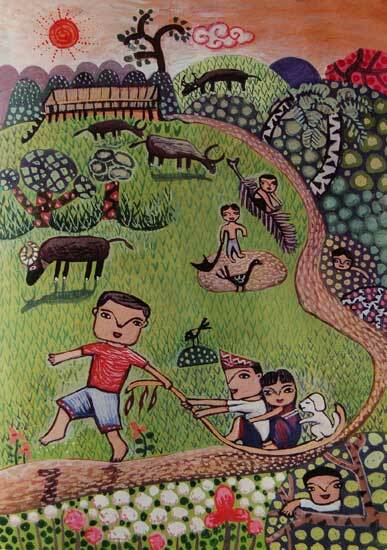 Jainal’s book Longhouse Days (Picture Book Art, (Malaysia), 2011) is narrated in the first person by a boy introducing readers to his daily life—his family and friends, chores, games and animals—all aspects of life that are familiar in essence to the book’s readers, but also offering fascinating insight into a what it was like to grow up in a longhouse community. 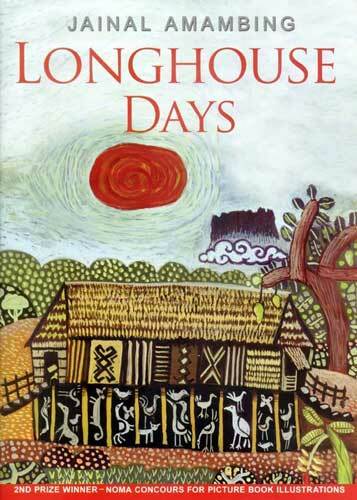 Jainal won Second Prize in the 15th Noma Concours in 2006 for his entry of ‘The Last Day I Lived in a Long House’. There are notable differences between the competition illustrations and their final, published versions, as can be seen comparing the examples above and below. 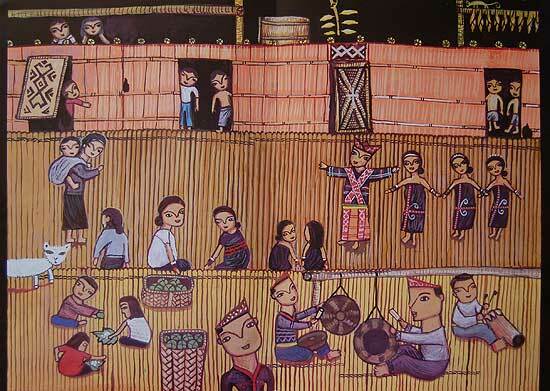 Longhouse Days also has good ‘Reference notes for teachers and parents’ at the end, that older children will find interesting too. 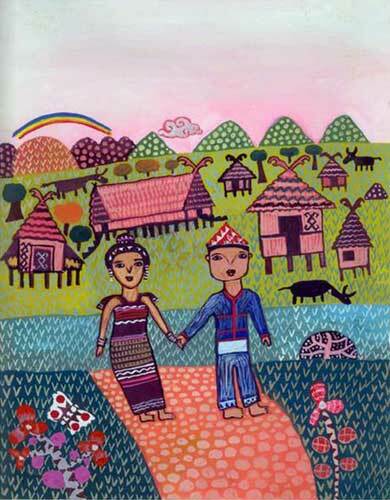 As well as learning about a different way of life, it’s a great book for talking through feelings about moving house – even if most readers will not share the experience of the boy in the story, who simply wakes up the morning after a party in the longhouse to discover he has moved to a new home with his family! 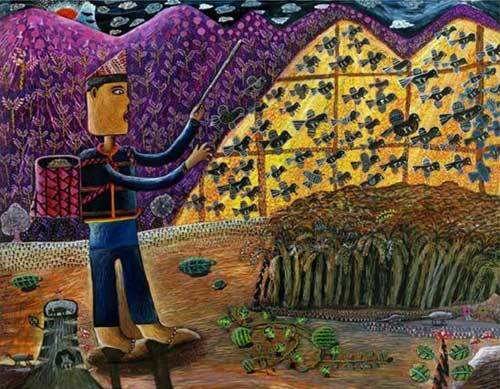 Jainal took up this theme again recently in a series of five huge oil paintings exhibited in 2013 at the Singapore Biennale: ‘My Longhouse Story’ carries strong echoes of his book Longhouse Days and is again autobiographical. 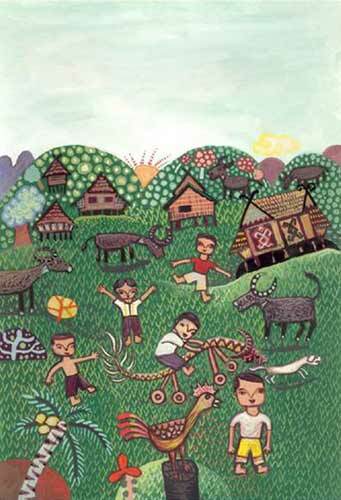 It shows a boy hiding to catch a chicken; playing on a grass sled with his friends (I think, my favourite subject of Jainal’s paintings – maybe you’ve noticed! 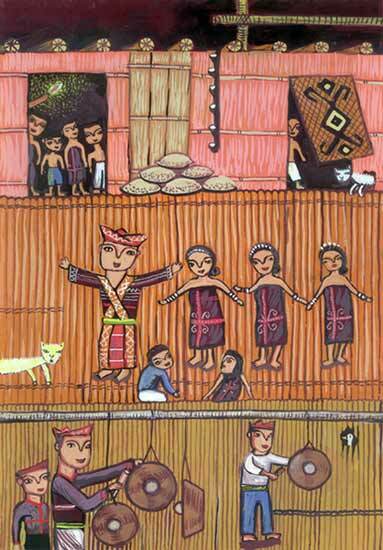 ); basket-weaving with his mother; watching dancers at a celebration in the longhouse; and walking away from his village to go to school. 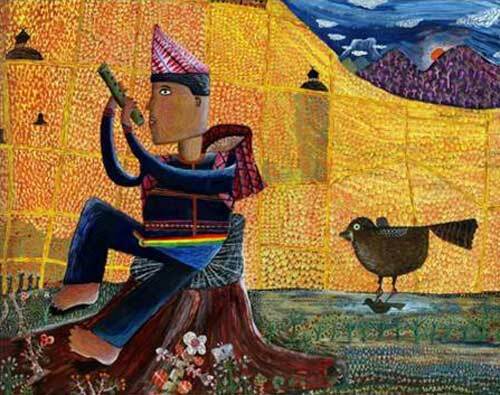 The Wonderful Sparrow (Picture Book Art, (Malaysia), 2011) is a simple folk tale in the vein of one good deed deserves another – a hungry sparrow interrupts a young farmer Usan-Usan’s flute-playing to the ‘princess of his dreams’, and once Usan-Usan has got over the shock of being spoken to by the bird, he complies instead of shooing him away. 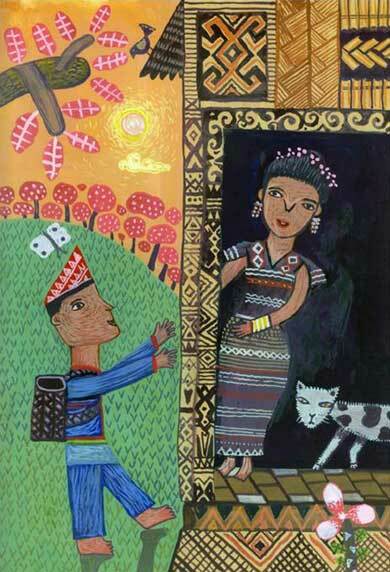 In return, the sparrow leads him to a palace, where the lonely princess is very happy to see him… If only life were so simple! It’s a sweet story that doesn’t attempt tpo go beyond the bare bones of the narrative, but allows the rich illustrations to do most of the talking. 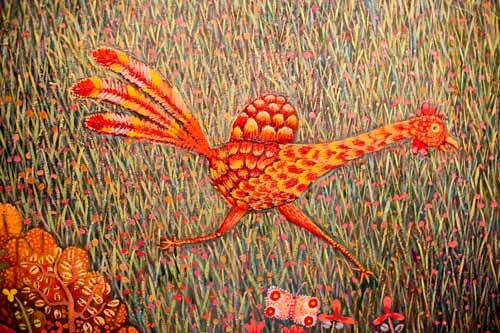 The photograph of the detail of the painting in the ‘My Longhouse Story’ cycle is ©Ren Rong; it is linked to her original blog post about the 2013 Singapore Biennale and I am grateful for her permission to use it here. 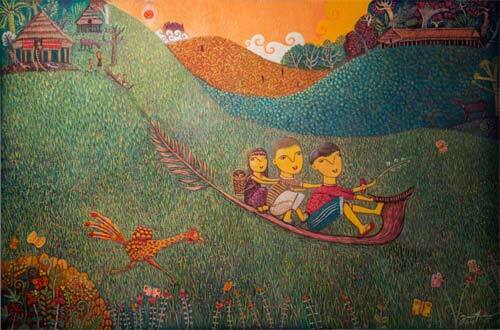 The photographs of Jainal Amambing and images of his artwork are ©Jainal Amambing and are used with permission. Reproduction without express permission is forbidden. 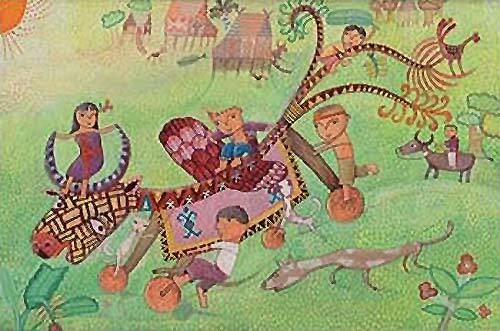 Ambau, Children's and YA Books from Malaysia, children's books set in Malaysia, Jainal Amambing, Linda Tan Lingard, Longhouse Days, MWD article, MWD interview, My Longhouse Story, Nami Concours, Nami Island International Picture Book Illustration Concours, Noma Concours, Oyez! 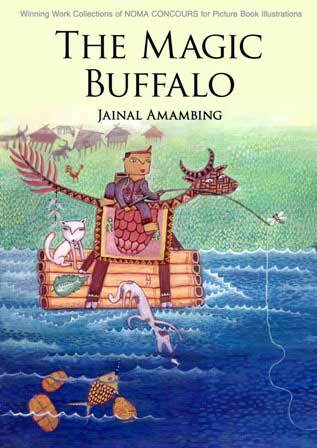 Books (Malaysia), PeopleinPublishing blog, Picture Book Art (Malaysia), Rungus longhouse, Singapore Biennale 2013, The Magic Buffalo, The Proud Butterfly and the Strange Tree, The Wonderful Sparrow, Yusof Gajah, Yusof Gajah Lingard Literary Agency. Bookmark. Thanks Marjorie for such a detailed and interesting article! I am going to print it and keep it in our bookshop so that people can read it as well. Thanks so much! Thank you, Linda. It couldn’t have happened without you! Bangga dgn pencapaian Anak Rungus . Tahniah . 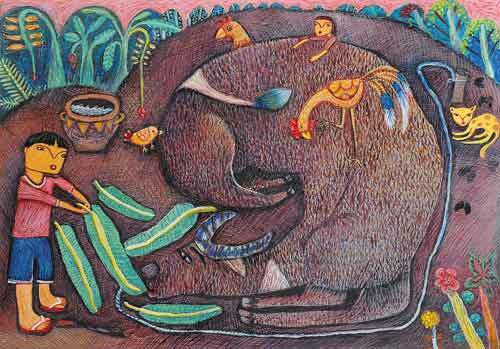 My dear your works are very nice. 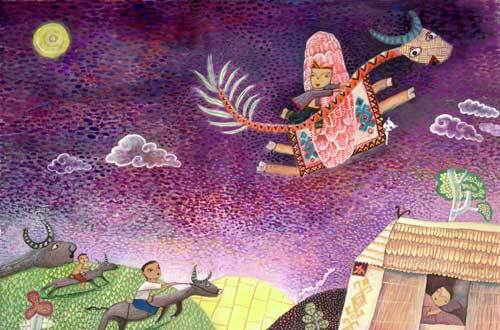 Check out Jainal's profile at the Yusof Gajah Lingard Literary Agency and on the 100++ Malaysian Illustrators site. 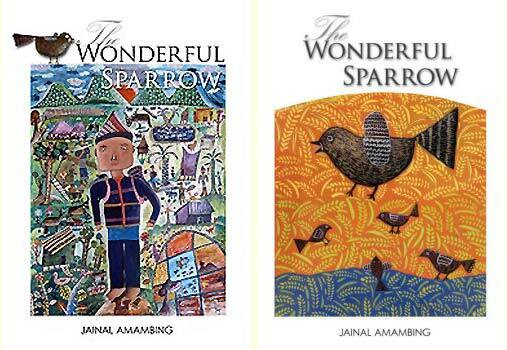 Find his books on the 100++ Malaysian Children's Books site. 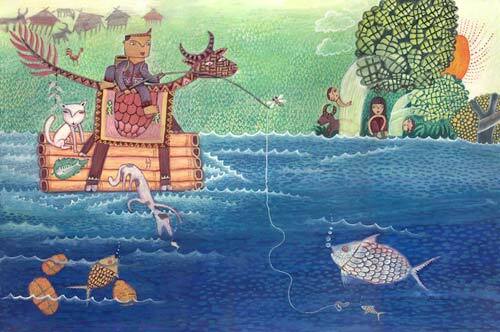 View all the paintings from 'My Longhouse Story' (2013), and read the Education Kit produced by the Singapore Art Museum.